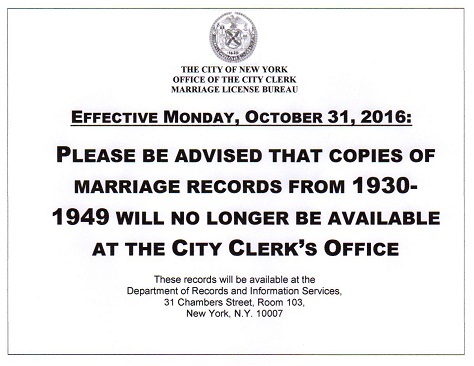 Effective Monday, October 31, 2016, copies of New York city marriage records 1930-1949 are no longer available at the Marriage Bureau of City Clerk's Office. These records are available at the Department of Records and Information Services of the Municipal Archives. We can obtain exemplified copies of New York City marriage records registered in Manhattan, Brooklyn, Bronx, Queens or Staten Island before 1949 from the Municipal Archives, and have them legalized by an apostille or foreign embassy. Order online or contact us. Related search terms: "new york marriage certificate with apostille", "new york apostille legalization", "new york exemplified marriage certificate with apostille", "brooklyn marriage certificate with apostille", "bronx marriage certificate with apostille", "queens marriage certificate with apostille", "richmond county marriage certificate with apostille","how to get an apostille for a new york city marriage certificate"
Free document evaluation: is your document eligible for an apostille? Is your document eligible for a New York apostille? Not all documents qualify for apostilles (unfortunately!) For example, you cannot submit for a New York apostille a notarized copy of your birth certificate, or a copy of your passport attested as a true copy by a notary public, or an original marriage certificate (unless it is a certified copy with certain signatures and seals). This is why, to save you time, we offer free document evaluation service. Just email a copy of your document to us or fax it to (800) 905-0421, and we will tell you if your document qualifies for a New York apostille or embassy legalization. If your document is not eligible, we will advise what steps need to be taken. 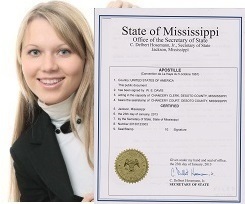 We evaluate documents from other states, too, and provide apostille services in all U.S. states. We understand that your documents are confidential. We DO NOT keep copies of your documents on our server or anywhere in our system. Related search terms: "new york apostille", "new york apostille legalization", "new york birth certificate with apostille", "new yorkmarriage certificate with apostille", "how to get an apostille in new york", "how to get an apostille"
Do you need an apostille for a New Jersey document? New Jersey apostille is a seal that will make your NJ document valid outside the U.S. In addition to New York, we provide FAST and RELIABLE apostille services in the neighbouring State of New Jersey for all kinds of documents originating from this state, both personal and corporate. We can also obtain many kinds of documents from NJ state agencies, including certified copies of vital records (birth, marriage, death, single status), court judgments, corporate documents, etc. Related search terms: "new jersey apostille", "new jersey apostille legalization", "new jersey birth certificate with apostille", "new jersey certificate with apostille", "how to get an apostille in new jersey", "how to get an apostille"
How to get an apostille for a New York driving record? If you need to get a New York apostille for your driving record in the State of New York, we will be happy to assist you! 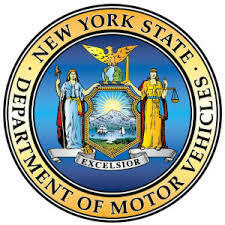 Abstracts of Driving Record do not need to be notarized or certified in any way, as the signature of the Commissioner of Motor Vehicles is on file with the New York Secretary of State Office. Just send us the original document by mail or a copy by email and we will take care of the apostille process. Related search terms: "new york apostille for driving record", "apostille legalization for driving record", "new york driving record with apostille", "motor vehicles apostille"
A new program is being implemented in some Greek consulates that that will help Greeks living abroad to get documents and official certificates online. The program is called Proxenos. As a first step, the consulates will issue birth certificates and family status certificates as long as the applicant is registered in a Greek municipal personal records database. The services will soon extend to provide more certificates. 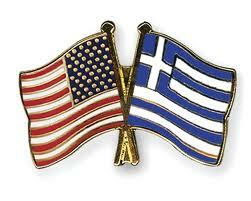 Now the program is being implemented in the Greek Consulates in Australia and in Dusseldorf, Germany. What about the United States? Related search terms: "greek birth certificate", "how to get vital records from greece"
How to get an apostille for your Certificate of Naturalization? When a naturalized US citizen needs his or her Certificate of Naturalization apostilled, what would be the proper way to do it? Certificate of Naturalization is one of the documents that are not very easy to authenticate for foreign use. First of all, it is illegal to make a copy of Certificate of Naturalization (except for personal use). Therefore, it is not possible for a notary public to attest to a true copy. So, how is it done? IMPORTANT! Your Certificate of Naturalization is a very important document, and should be treated accordingly. DO NOT send the original Certificate of Naturalization to any apostille agency. Obtain a true certified copy, and have it apostilled! Related search terms: "apostille certificate of naturalization", "certified certificate of naturalization", "notarized certificate of naturalization", "how to get an apostille for certificate of naturalization", "new york apostille for certificate of naturalization", "uscis true copy", "uscis copy apostille"
How to get a New York Hague apostille for Italy? 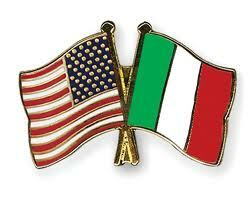 If you need to get a New York apostille for use in Italy for a personal or a corporate document originating from the State of New York, we will be happy to assist you! Both the U.S. and Israel signed the Hague Apostille Convention, therefore all U.S. documents bearing Hague apostille stamps will be legal and valid in Italy. Related search terms: "New York apostille for italy", "apostille legalization for italy", "new york birth certificate with apostille", "new york marriage certificate with apostille", "how to get an apostille in new york", "how to get an apostille for italy"
Do you need your New York diploma or transcript attested (authenticated, legalized) for use in the United Arab Emirates? 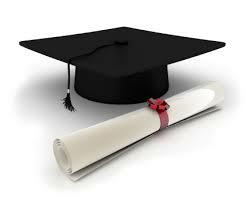 Not all diplomas qualify for UAE Embassy attestation. Therefore, the first step is to make sure that your degree is eligible. The general requirement is: your educational institution must be located in the United States and must be regionally accredited by NEASC (CIHE), MSA (CHE), NCA (HLC), SACS (COC), NWCCU, or WASC (ACCJC-ACSCU). To show proof of regional accreditation, please visit the CHEA Database (link is external) of Institutions and Programs and look for your institution’s accreditation information. Related search terms: "uae legalization", "uae authentication", "uae diploma attestation", "diploma for united arab emirates", "uae embassy legalization, "certificate attestation for uae"
Do apostilles from all states have to look alike? Why do apostilles look different in different states? Yes, they do look different. In fact, they look so different that on many occasions the receiving agencies overseas get confused. 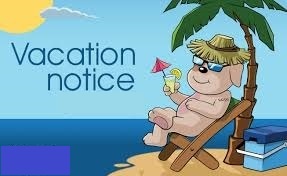 In wost cases apostilled documents get rejected because foreign officials expect apostilles from the United States to look exactly like apostilles from other foreign countries. 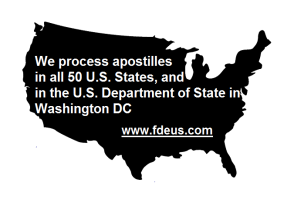 The fact is that apostilles from different U.S. states do not have to look exactly the same. 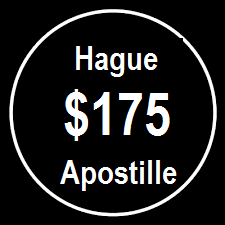 An apostille must meet the general requirements specified in the Hague Apostille Convention. Color, fonts, images, seals, ways apostilles are attached to documents, etc. can vary depending on the preferences of the issuing apostille agency. Related search terms: "hague apostille", "what does apostille look like", "apostille rejected", "apostille in spanish", "different apostilles"